With over 50 years of combined gymnastics coaching experience, Dale and Robyn Grant know a thing or two about gymnastics. They also know what's needed in a building in order to operate a successful gymnastics gym; high ceilings, the right square footage and the right location. "We actually looked at this building 12 years ago, but at the time we wanted to lease and the owner wanted to sell; it wasn't the right time," said Dale Grant, Flipz Gymnastics owner. "Instead we opted to lease space on Hall Street in Concord, but as we continued to grow and need more space, I've kept my eye on this building. Over the last 10 years, I've watched as owner after owner couldn't make this space work." For the fourth time within a decade the 8,000 sf building on Chenell Drive went up for sale, Dale and Robyn both knew this time...was their time. "Robyn and I owned and operated two gymnastics gyms in Northern California for eleven years," said Dale. "I was familiar with Economic Development Councils having previously worked with them in California. I made the call to CRDC and together; Jennifer and I along with my bank, Bank of New Hampshire, we puzzled together a loan. Jennifer was great, very responsive and kept the entire process moving along." "In anticipation of the building going back on the market, Dale had been in to CRDC to discuss potential financing options," said CRDC Loan Officer Jennifer Boulanger. "He was then able to react quickly with an offer and together with Bank of New Hampshire we structured a financing package utilizing the SBA 504 loan program as well as some direct funds through CRDC's Revolving Loan Fund." 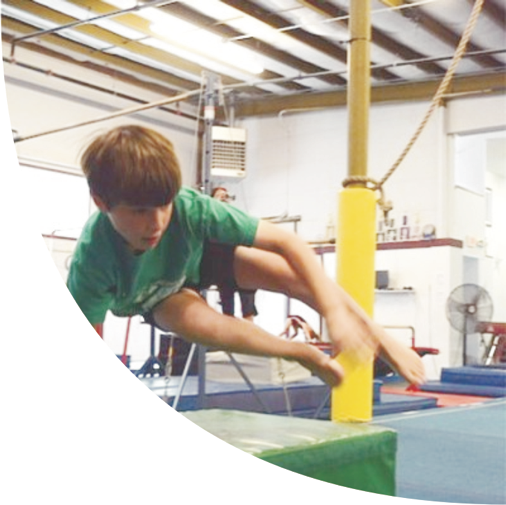 In addition to the traditional gymnastics programs at Flipz Gymnastics, Dale created a Ninja Training program to capitalize on the growing fitness trend and the popularity of the "American Ninja Warrior" televised competitions. Creating this program was an easy expansion of services as Dale was able to utilize the gymnastics setting, equip ment and knowledge to create the program. Enrollment in the program continues to grow and Flipz and their team of Ninja's recently participated and hosted their first Ninja competition.